Say I have two independent random variables $X \sim N(u_1, \sigma_1)$ and $Y \sim N(u_2, \sigma_2)$. I want to get the conditional distribution of X given whether X is bigger than Y or not. 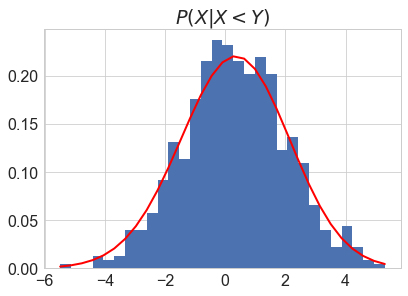 (2) How to get the mean and sd for $P(X|X<Y)$ and $P(X|X>Y)$ if they are still normal? How to get the mean and sd for $P(X|X<Y)$ and $P(X|X>Y)$ if they are still normal? which does not mimick CDF of a normal. Not the answer you're looking for? Browse other questions tagged normal-distribution conditional-probability truncated-normal or ask your own question. 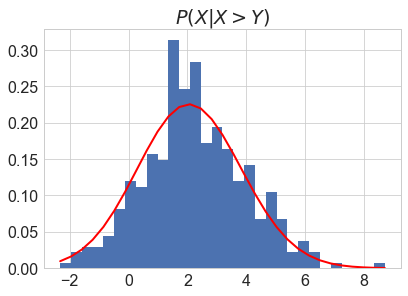 When is the distribution of product of two normal distributed variables near normal distribution?